The ISTAT Foundation Internship Program assists in the development of aviation-focused college students desiring to become productive members in the aircraft trading industry and generates qualified employment candidates for ISTAT member companies. The ISTAT Foundation Internship Committee acts as an intermediary between ISTAT member companies and students seeking aviation internships. Through the use of our web portal, qualified students and employers are able to match the right skills, background and interests with corporate internships. 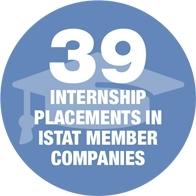 To view internship positions at ISTAT member companies, click the below button. Contact Warren Willits (wwillits@jetstarpartners.com) to register your company in the portal. Once your company is registered, click on the link below to post open internship positions. The 2017-2018 Internship Committee is comprised of Murrae Ross-Eskell (Chair), Priscilla Ang, Peter Blakeney, Kristen Chmielewski, Bruce Dankberg, Angela Geremia, Bryan Lange, and Warren Willits. For more information on the ISTAT Foundation Internship Program, please contact ISTAT Foundation Headquarters.